Lisa has always been fascinated by characters and inspired by stories of ordinary people in extraordinary circumstances. She has lived her dream of being a psychotherapist. Now she is living her dream of writing. Lisa's first short story, "Road to Dreamland," appeared in the November 2009 issue of Kansas City Voices magazine. Lisa graduated with a degree in psychology from Baker University and a Master's Degree in clinical social work from the University of Missouri - Columbia. She provided counseling services for nearly sixteen years. Now, Lisa is a stay-at-home mother. 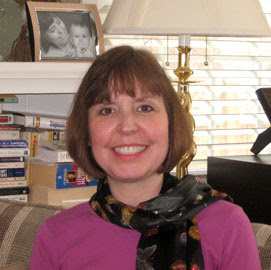 Lisa is actively involved with the Kansas City Writer's Group and two smaller writing critique groups. Her writing interests include poetry, short stories, flash fiction, and essays. Eventually, Lisa hopes to write a screenplay. Lisa lives in Kansas City, Missouri with her husband and their three-year-old daughter. If you haven't had the opportunity to read Lisa's story, Last Words, head over to the contest page and then join us for our delightful interview. WOW: Lisa, welcome to The Muffin! Congratulations on earning 2nd place in our Fall Flash Fiction contest. I enjoyed reading Last Words. The premise is so powerful, yet it's universal. How did the idea develop? Lisa: Thank you. I am so fortunate to have supportive friends and family. One of my close friends, Kathy, gave me a wonderful book a couple years ago, The 3 A.M. Epiphany by Brian Kiteley. In it are numerous prompts and writing exercises. "Last Words" came from one of the prompts from this book. The prompt used a phrase from William Carlos Williams, "No ideas, but in things." What came to me was the quilt, the bedroom with the dresser, canopy bed, a padlocked chest, a sapphire ring, and the Bible. I have fond memories of visiting my grandmother and watching while she applied make-up and talcum powder. For the story, I had the idea that the man character would sneak away from the visitation and steal something. It helps me to have the ending in mind before I write. I'm a visual person so I often see the story before or while I write it. I can still clearly see the house in my mind. The key is to be sure I put the right amount of those details down on paper, not too much or too little. WOW: You generated such a great list from the exercise! Sounds like I need to check out this book. (smiles) Lisa, you formerly worked as a therapist. How did that experience influence your writing style? Lisa: I first had the dream to be a therapist at age 12 and the passion continued for a long time. I've always been interested in people and amazed at their resilience and intrigued by their motivations. I love character studies and revealing motivations. I also like surprises in my stories mainly because I think people surprise us in real life. Just when you think you know someone they do something to change your view of them. WOW: I agree. People always surprise me! What are a few of your writing pet peeves? How do you break - or advise others to break - those habits? Lisa: I dislike boring narration. I love, however, when an author shows a character or story through dialogue and action. I am a very picky reader and I put a book down quickly if it doesn't keep my interest. My advice is to make the story as compelling as possible as early as possible in the story. Belonging to a writing critique group is so beneficial. I belong to the Kansas City Writers Group for their compassionate critiquing and for the inspiration I receive in hearing really good writing. Hearing your work read aloud by someone else is also a real benefit so you can hear the glitches in your writing and where it bogs down. WOW: Great advice. I especially like listening to someone else read my work. It's a great way to catch the errors. Let's talk for a moment about your first memories of writing. What's the first piece you wrote and what was the reaction to it? Lisa: I wrote poems as a child and some short stories. My parents were very supportive and encouraged me in all types of creative avenues. I never entered a writing contest as a child. I was more interested in art and then later in the counseling field. After quitting my day job as a therapist to adopt our daughter and be a stay-at-home mother, I found a writing workshop lead by Lawrence and Suella Walsh. They are incredibly talented writers and teachers. One of my first pieces, "Road to Dreamland" was a product from an assignment in the Walsh's class. It was well received and eventually was published in the Kansas City Voices Magazine in 2009. It has taken me a long time to see myself as a writer. Even after publication. There are so many talented writers out there, but I'm learning from writer friends that each of us has stories to tell. We have an obligation to ourselves and to each other to write those stories and possibly bridge feelings of isolation. I think good stories show the universal human experience. WOW: Sounds like you've had an interesting publication path. Entering contests builds a writer's toolbox of skills. What advice would you offer a writer who is considering entering a contest? Lisa: Do it! And do it again and again. I really believe in contests because it gives you a framework like a topic or genre and a word limit. You have to do your best to edit your piece. Contests give you a deadline and motivation to pull out those pieces of work you've left in your drawer, pages yellowing with age and neglect. If given enough attention and work, those pieces might bring in some cash. Winning second place in WOW's contest has helped me to believe in myself as a writer. That has been a real process for me. The writing group has helped me learn about contests and has given me the courage to enter and the knowledge and skills to improve my writing. WOW: Yes, yes, yes! Enter and keep entering. So important for writers to keep that positive attitude. I imagine you're busy with your young daughter and family, but what projects are you currently working on? Lisa: I have written a short memoir piece about when my husband and I adopted our daughter at birth. That was such an amazing experience. I'm writing more flash fiction and short stories. I have not attempted a novel yet, but maybe someday. One of my short stories, I've been told, is more of a young adult novel. That's often a problem for me. I try to write too much story for a short story sometimes. I'm continuing to enter contests and I'm proud that at this time I've entered more contests than at any other time in my writing life. It's still not a lot, but I've got to keep writing. I love to edit, I think, sometimes more than writing, but I have to write to have something to edit. Luckily there are plenty of topics. WOW: You are busy! Congratulations again, Lisa, and best wishes in your writing future. Lisa: Thank you so much for the opportunity to discuss my writing. This has been such an honor and privilege. Interview by LuAnn Schindler. Read more of LuAnn's work at LuAnn's Writing on the Wall. This book sounds wonderful and your bubbly personality shines through this interview. It is nice to see a fellow Missourian living their writing dream. I keep plugging away but it goes so slowly; there is so many other responsibilities in life.